Books on prayer are always a risky proposition. They tend to raise some sort of controversy, whether they want to or not. The Prayer of Jabez got lots of heat. It was a little book, and wasn’t intended to be a treatise on prayer. Did Wilkenson over-state his case? At times. But the book was not heretical like some people (at least in my circles) made it out to be. Could have done without all the hype that spawned an industry. Or take E.M. Bounds. Some people love his stuff. I just end up feeling guilty. It only points out that facts that my prayer life is not like Martin Luther and John Calvin’s. Not so helpful for me. 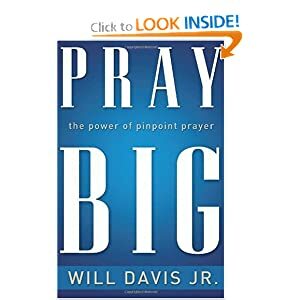 It is into this conflicted world that Will Davis Jr. released his latest book on prayer- Pray Big: The Power of Pinpoint Prayers. I’m not sure what I was thinking when I asked for a review copy. I guess I was hoping it would help my prayer life. I’ve seen some reviews on Facebook- some people like this book, alot. There were warning signs. One of the blurbs on the back is by Don Piper. Yes, Don. 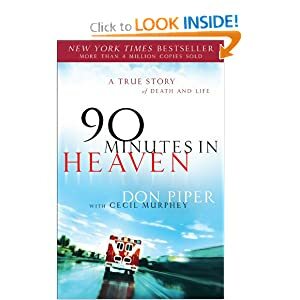 He of 90 Minutes in Heaven fame. The book that apparently has spawned its own cottage industry of calenders and devotionals. Call me old-fashioned, but I’m thinking that if there is something about heaven God wants me to know, it will be … in the Bible! So a guy who has functional issues with the authority of Scripture really likes this book. Not a selling point for the likes of people like me. Initially I had some agreement with Pastor Davis. Most evangelicals are pretty superficial in their prayers. “Bless Josh” is not really what the Father is looking for. It reeks of a lack of thought both in knowing God and knowing Josh. I also agree with Pastor Davis that Scripture should direct our prayer life. Our areas of agreement began to dissipate quickly. So quickly that I never finished the book. The reason was there were unconstructive thoughts arising. I felt I was being overly-critical. Perhaps I wasn’t, but I decided for my own sake to stop reading. Little did I realize it had it’s own cottage industry. What was the problem? I’ll mention 5. I was working on a Sunday School curriculum today for January. In my denomination, this January will be Evangelism Emphasis month. So my sermons and SS will be about evangelism- the need to, motives to, how to etc. The second lesson is on how both word & deed are essential to evangelism. Sadly, I recently heard an otherwise good radio show that treated them as antithetical. In looking for some good quotes I opened up my copy of Jerram Barrs’ The Heart of Evangelism. If you haven’t read it, this is a great book that I probably need to read about 5 times in a row so God can get it through my thick skull. 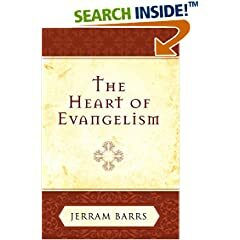 Jerram thoughtfully and gently explores lots of helpful avenues including addressing barriers between the church and the world, contextualizing the gospel, etc.